I just spent quite a few hours on the phone with different people and the same question comes up time and time again. Should I get a German shepherd ?. My question first is why do you want a dog? German Shepherds shed a lot. We have found that the plush and long coated dogs do shed slightly less. I did say slightly. Next German Shepherds are barkers. They love to talk both to alarm you that someone is here and to let the world know that they are here. German Shepherds do love children and they love the job of a nanny. They will look after your children as if they were their own puppies. Sometimes that is good and bad. They are protective the GSD (German Shepherd dog) will step in. Generally the GSD wants to be a part of the family. They don't like being backyard dogs and they feel hurt if they are not part of the family. However I do suggest that you let them know who are "mommy" and "daddy" in the family. Otherwise they will see that description open and take the job. 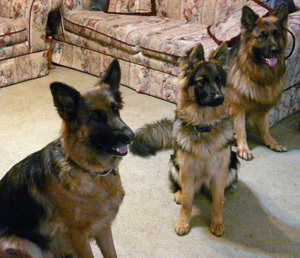 The easiest way for them to know that they are a member and not the leader is to take the GSD to basic obedience class. Look at it as a training class so that you can learn a foreign language and your dog can learn yours. Food is a universal language and so is LOVE! 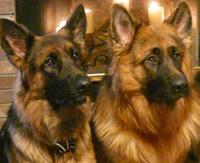 When getting your GSD there are two reasons to get one that is AKC (American Kennel Club) Registered. One is that you have a better chance of getting a dog that has been bred to the standards and most important the family pedigree has been evaluated for hip, and elbows against generic diseases. This is not a 100% perfect since they are living creatures and genetics go back quite a ways. This being said your chances are better than that of a dog with no history background. The second reason that I suggest a registered dog is that you need to decide on what job your GSD will do. All living creatures like to be on this earth for some purpose and your GSD is no different. AKC Rally is a great place to start. Dogs that are 7 months and older can compete in basic obedience. Like what you learned in that class that you took. You can start out with your dog on a leash and turn left, turn right, sit, and the fun stuff you do with your dog. This is a fun competition that you can pass and your dog can now earn a title to his/her name. I had my daughter take this one step further and she did a presentation in her 4H and FFA (future farmers of America ) club and she won the national title. So for you vet want to be's out there I suggest you start looking at your dogs as an investment to your career as well. Speaking of Boys vs. Girls. I always get this question too. What is better? I use my wise grandfather's approach to this subject. He told me that you look at a dog in this way. The boy thinks with his head and the girl thinks with her heart. Generally I have found the male to be using his head and more protective for his territory. Girls are more sensitive and they seem more willing to learn our language and for first timers this is an easier choice. Thanks to my grandfather we have enjoyed German Shepherds in our home and as family member for many years. My kids are grown and I love the security I feel with my dogs. My grandchildren love the dogs and there is a mutual respect and admiration for each of us.